From #1 New York Times bestselling author Doreen Cronin and Caldecott Medal–winning illustrator David Small comes a picture book about how an extraordinary “ordinary” girl can save a kingdom with the help of a mud fairy. A glass kingdom is no place for a Mud Fairy. 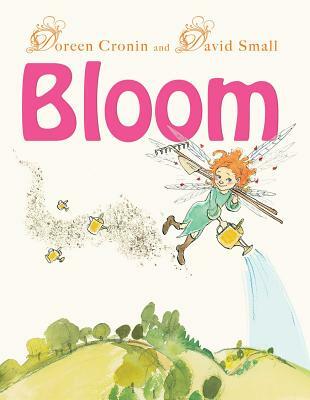 Bloom and her mud fairy magic might be able to turn weeds into flowers and spin sand into glass, but the people of the kingdom ceaselessly complain about the trails of dirt and puddles of mud that seem to follow her every step, and finally they cast her out. But when the glass castle begins to crack, then cracks some more, the King and Queen in a panic search for the long-banished fairy, but they can’t find Bloom anywhere. Desperate to save their home, they send their meekest, most ordinary subject, a girl named Genevievewhose sole task until now has been to polish the Queen’s crystal sugar spoon—to coax any worthy fairy to come and save the kingdom. Genevieve finds Bloom exactly where the king and queen failed to see her, and Bloom knows exactly how to save the kingdom. But it will take the two girls working together, along with a mighty dollop of self-confidence—and some very messy hands—to accomplish the extraordinary.